Is SUN and FUN listed as keys to your next vacation? Look no further because you will find huge quantities right here in Key Largo! 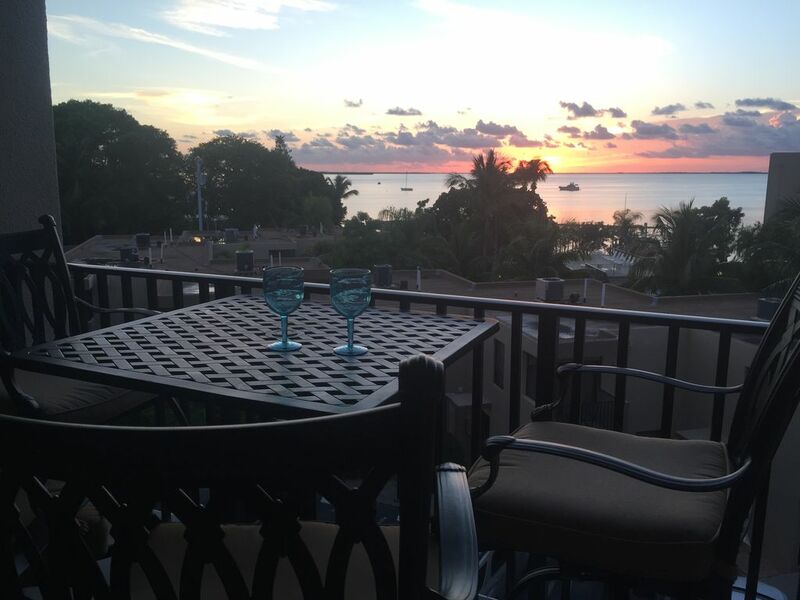 Our COMPLETELY REMODELED condominium provides an ideal location to enjoy the best of the Florida Keys. You won't find another unit like this. Located on the 4th floor, you are high enough to see over the town homes and view Blackwater Sound. As we are in middle of the building, your views are not blocked by the other building so you can enjoy sunsets right on our balcony. Nightly beautiful sunsets are amazing, whether viewed from the unit balcony or down at the docks. Bring your boat and use our dedicated boat slip (slip #5). There is a king bed in the larger bedroom which faces the water. Automated lutron shades in the main bedroom offer privacy when needed and full views of the bay when raised. There is a queen bed in the second bedroom. Each bedroom has it's own closet and each has a comfortable memory foam topper that gets regular compliments. In addition, there is a full size murphy bed in the front entry along with a built in for storage of clothes and misc. item. This allows the front entry to be used essentially as a 3rd bedroom offering both privacy and storage. Custom kitchen and bathroom cabinets, all new kitchen appliances and accessories (plates, cups, silverware, coffee maker, toaster, blender etc), new bedding, rugs, towels, lighting, ceiling fans, windows, couch, patio furniture, tile and doors. A 60" flat screen smart television with TiVo and Apple TV provides renters with a variety of video choices. A SONOS sound system allows you to steam your favorite music right off your smart phone, tablet . The Lutron motorized shades allow for light and views to filter through while blocking the intense heat of the afternoon sun all at touch of a button. This fantastic remodel complimented by all the renovations on the outside makes our unit the best rental in Moon Bay! Bring your boat because this unit comes with its own 30-foot slip. If you do not have a boat, do not worry because there is plenty to do in Key Largo. The private, gated community of Moon Bay boasts two heated pools (one for kids and one for adults), large sun deck, a tennis court, recently renovated clubhouse with Ping-Pong table, TVs and saunas, outdoor barbecue with running water and seating, and a fish cleaning station on the dock. What is your pleasure? Diving? Snorkeling? Deep-sea Fishing? Swimming with dolphins? Eating out? Shopping? Relaxing? Well, you are in luck, because you will find it all right here! Our family loves being outside. My husband and I are originally from Colorado and we make sure we get back to see family every year and make sure our sons grow up loving the mountains. Most Coloradans love water as well and we fell in love with the laid back, easy going vibe of the Florida Keys. We've learned the difference between a map and a chart and that fishing poles and 'Rods and Reels' are NOT the same thing! Moon Bay offered the amenities that we wanted. It was easy to get to, gated, had a pool and a marina. The other owners are wonderful and welcoming to new owners and guests. The grounds and pool are very well maintained. Our family from Colorado loves to use it as well and we've found a great jumping point for day trips from Miami Beach to the Everglades and Key West. Most updated and best designed unit in Moon Bay. Only unit with a fold down full size Murphy bed rather than a fold out couch or blow up mattress. We get great feedback on our comfortable bedding and all the little touches included. Who else has motorized shades at the touch of a button in living room and MBR? Awesome bayside water views with direct view of spectacular sunsets nightly. Private marina adjoins the Moon Bay complex. Bring your boat up to 30' and park in our dedicated boat slip. Brand new stainless fridge with ice and water in door. Yes, everything you should need. Fully remodeled and custom kitchen design. Built in dining area with seating for five. Outdoor seating for 4. SONOS soundbar allows renters to steam their favorite music and play via their smartphone app. Enjoy our reclaimed balcony From this 4th floor vantage point you have excellent water views and amazing sunsets. Bring you boat up to 30' and park in our dedicated slip in the marina. Great location for visiting the Everglades, Biscayne and the Keys! This condo is in a great central location for all of the nearby activities and parks. It is well-maintained, stocked with essentials and very comfortable for our family of 4. The pool and sunsets from the patio were a huge bonus. Everyone we met at the condo was very friendly, and we always felt welcome. Great find in the Keys! Our family had a great 4 nights at Moon Bay. The location was perfect for us in North Key Largo right on the bay. The inside upgrades were above and beyond. Nice heated pool! The kids loved basketball, foosball, ping pong and the dock. Great little community and everyone was so friendly. We would definitely come back again! Thanks! Just returned from a one week stay at Alison’s condo and it was fabulous. The photos are great but it’s even better in person. Beautifully decorated and very comfortable. There is a little road noise on the road front side but that’s the way it is in the keys. Not a big deal. Could also use a few more hooks in bedrooms and half bath. Again, not a big deal. There’s a couple of coolers to use which we did quite often and plenty of beach towels so don’t pack any. The grounds are very well kept; spotless and quite lovely. We walked out on the dock and in one weeks time we saw a manatee, lots of fish, a barracuda 😳� and a ray! Most folks are retirement age and very friendly; didn’t seem to mind us short time renters at all. It’s a very quiet community so if you want excitement, look elsewhere. The only small criticism is the lack of shade. Could use a few more umbrellas; a few on the “beach” would have been great. A couple of decent restaurants within walking distance; Sundowners was very nice with good food and service and a spectacular sunset view. Jimmy Johnston’s was a nice location too; food was meh. Had a band on Friday in the tiki hut which was a lot of fun! All in all great time and would stay again in a minute! I thought the value was excellent as well; very fair price for the area and amenities. Well done Alison and thank you so much. We had a great time just relaxing and the condo was just perfect. We didn't want for anything. Lots of towels, pots, pans etc. Nice updated clean condo. Enjoyed our one week stay. Rates and availability subject to change until reservation contract is received.